That relation between us, or among us follows bodies on the move, their action, retracing displacements and transitions, but also those passages from one place to another constituted by acts of translation. The programme recovers some of those moments recorded by the camera: it examines the process of an “experimental archaeology of the present”; it exposes diachronies, the shifts between different border regimes, the continuities of power and the subjectivities that resist it. The programme reconstructs transnational counter-histories as they emerge from the productions and practices of “minor”, decolonial, accented cinemas: they oppose the fiction of an ever-present migration emergency – an “emergency” produced and perpetuated by European policies that make people illegal, by borderisation and spectacularisation mechanisms, and which goes from one “crisis” to the next. What comes to light in the films of this programme, and what is also at stake for the praxis they invented, is a relation. This arises from the action of bodies that appear, speak out, take up the camera, became visible or imperceptible, when they act in concert and invent new forms of alliance, solidarity and commonality. Beyond the chronicles of this action that articulates a principle of equality, what is therefore at stake here is nothing less than freedom – that “relation that can and does happen between us, or indeed among us” – and, ultimately the politics of the possible. Taking the form of an occasional film society, the screening programme that relation between us, or among us is a section of Making–Unmaking, a multipart project by Maria Iorio / Raphaël Cuomo. It will accompany their exhibition at Archive Kabinett (December 2018 – January 2019) and develop autonomously thereafter. That relation between us, or among us unfolds in the itinerant series a cinema situation, a long-term project initiated by Maria Iorio / Raphaël Cuomo, which involves research, workshops, lectures, screenings and performances. Displaced outside of the cinema, the films invite us to form a new assembly. The series a cinema situation concentrates not only on the films but also on the potentiality of this assembly and, more widely, on the social practices that have contributed to the creation of new film cultures – film societies, cineclubs, film-makers clubs within decolonial movements, video salons, film workshops, etc. – by establishing other modes of production and distribution, by setting up spaces of freedom, sites for emergent subjectivities. The series would have us question our relation to the films, to their images, complicating it by a “situation”, a cinema situation, that opens up new aesthetic and political issues and encourages us to imagine new practices and futures for film. Annamaria Licciardello completed her PhD at Roma Tre University, Rome, in 2004. She is a film historian and programmer. Her main interest is in experimental and independent cinema. She collaborated with Tekfestival, independent film festival in Rome, the Rome Film Festival and now the Pesaro Film Festival. She has published articles and essays in books and reviews. In 2009, she edited with Sergio Toffetti Paolo Gioli. Imprint Cinema. Her book Il cinema laboratorio di Alberto Grifi was released in 2018. She currently works for the Centro Sperimentale di Cinematografia. 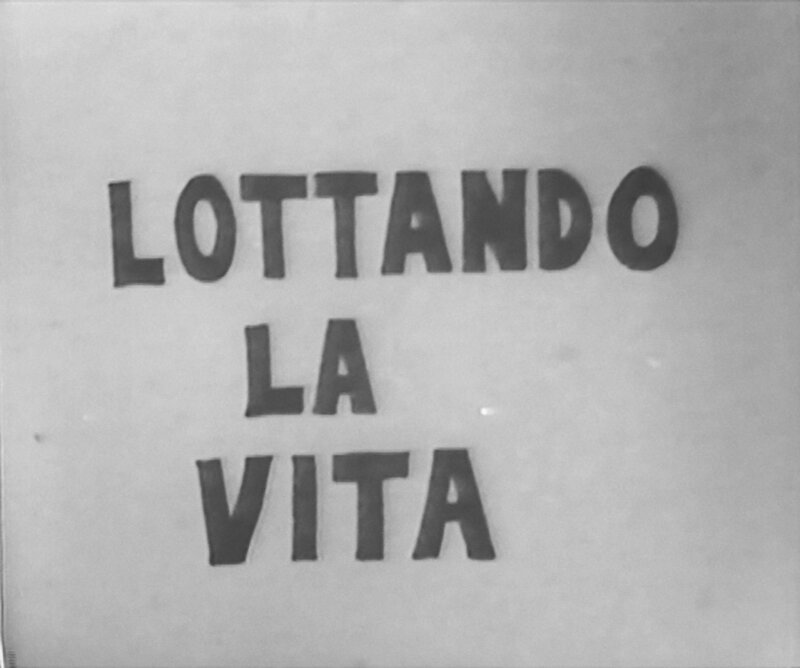 Videobase, Lottando la vita, 1975, 1/2’’, standard EIAJ, b/w, sound, 99’, video still. Lottando la vita is a video made by Videobase (a collective comprising Anna Lajolo, Guido Lombardi and Alfredo Leonardi) in West Berlin during a three-month residency facilitated by the DAAD / Berliner Künstlerprogramm. The three film-makers, who emerged from the Rome underground scene of the 1960s – early 1970s, disseminate counter-information on video, a medium well suited to grappling with a critical analysis of the real. Taking advantage of the specificities of early video and the autonomous modes of production it allows, their working process involves filming, presenting the recorded material and eliciting new comments that are further documented, in pursuit of an “experimental archeology of the present.”* Lottando la vita describes the situation of Italian Gastarbeiter in West Berlin via the accounts of bricklayers, pizza-makers and labourers. The video recounts the exploitation and marginalisation these workers experience on a daily basis. It also builds up a picture of the ways in which the migrants organise and resist, charting the steps leading up to the opening of the Casa di Cultura Popolare, an informal meeting place offering support to migrants on a host of specific issues – work, schooling, women ’s rights. The participation of those actually involved in these social struggles and their free, direct articulation of them, in their own words, radically transforms the investigative-film format into a new, unconventional form whose unusually long takes allow arguments to be developed, and for changes in emotional intensity. Videobase is a collective comprising Anna Lajolo, Alfredo Leonardi and Guido Lombardi. Active from 1972 to 1979, the collective produced militant videos and independent documentaries, as well as investigative reports for RAI. The film-makers were previously active members of the underground cinema scene in Rome. Alfredo Leonardi ceased his activity as a film-maker a few years after the collective ended its collaboration, and devoted his time to teaching. Anna Lajolo and Guido Lombardi continued to work together on film projects until the 2000s, in parallel with their practice as writers.